A reductionist viewpoint, which assumes that all important properties of cancer are ultimately encoded in a cancer cell, has provided an important stimulus for studies on oncogenes (1). Although this approach proved to be very powerful in establishing the genetic causes of cancer, it was in itself insufficient to properly interpret the resulting complexity of the unfolding pathological process (2). Indeed, cancer as a disease involves a multitude of interactions between heterotypic cellular and matrix components, of which cancer cells are the central, but by no means the only relevant element (2). In this sense, the intimate interrelationship and interdependence between cancer cells and the adjacent host vasculature are indispensable aspects of tumor very growth and dissemination (3). Based on this premise, Folkman proposed that tumor vasculature can be an attractive and universal target for anticancer therapy (3). This chapter is intended as a discussion of the linkage between formation of the tumor vasculature (tumor angiogenesis) and the causal disease-triggering effects of cancer-associated genetic alternations, particularly expression of activated oncogenes. 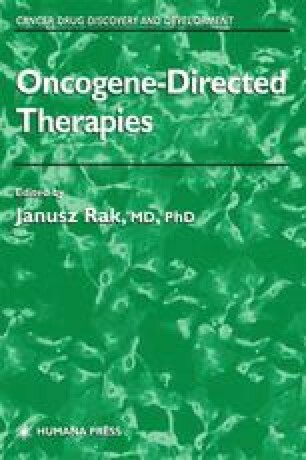 Here, it is argued that there are multiple ways by which oncogenes can impinge upon the course, the outcome, and the consequences of the tumor angiogenesis process. More importantly, oncogene-directed therapies (signal transduction inhibitors) can interfere with various aspects of tumor neovascularization and possibly synergize with other blood vessel-targeting and cancer cell-targeting agents.